The new design of the Super A4 movable arm joins an extraordinary feeling to an aggressiveness of cut without equal. Provided with air-oil jet on the bur, as Artiglio’s tradition, and switch-off magnets model holder, Super A4 is not only an universal milling machine but also a customized instrument to guarantee the maximum comfort of use. A led light (optional) with wide glass ring focus the brightness on the working area. Super A4, the result of a complete but essential innovative design. Furnished with electrical micro motor (with complete porta-chuck nuts ø 2,35 – 3 – 1,6 mm), digital electronic feeder with adjustable speed, electrical pedal, lockable model holder, spotlight and magnetic universal mandrel for attachments assembly and surveying. The standard Super A4 is Grey while in the version Comfort Pack is available with the column and the arms of the followings colours: Orange, Blue, Red and Green. Super A4 is also available in the exclusive version White. To look forward and to have an upgradable milling machine. To perform very easily all workings required by the prosthetic guided implant surgery. To work tirelessly thanks to the very ergonomic working position. 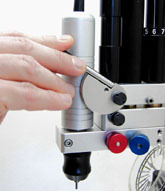 Device allowing the micrometric control of the vertical movement. 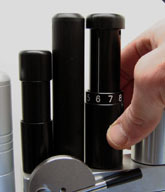 To easily carry out all drilling procedures. To realize channels and chamfers micrometrically controlled. It supplies the electrical feeding to the machine and is equipped with all regulation and control devices. In this way the feeder takes a minimal space on the bench. Accessory to be magnetically fixed to the movable arm to make the attachments assembly and the surveying simultaneous and precise. Integrated light equipment in the milling spindle of a wide diameter and calibrated intensity. In this way you will have a right lighting of the work at any time. The bearing structure of SA4 is arranged for the upgrade to SA6 or SA8 in order to achieve the performances of the Excellence line milling machines.